HyFlex 11-644 gloves combine a proprietary blend of high-performance polyethylene-engineered yarn with a gray polyurethane palm coating to provide ANSI Level 2 cut protection and Level 5 abrasion protection. This cut-protection technology ensures a high level of dexterity and flexibility, and promotes longer wear. 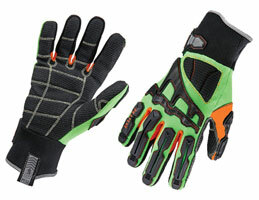 The gloves are soft and cool on the skin for all-day comfort. ProFlex 925F(x)CP Cut, Puncture and Dorsal Impact-Reducing Gloves employ Armortex – a technical, protective material – on the entirety of the palm to provide Level 3 cut protection and Level 2 puncture protection. Molded TPR armor on the knuckles and fingers of the dorsal side of the hand provides protection from impact, pinching, crushing and bruising blows. 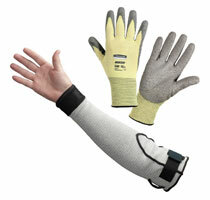 Memphis Dyneema APG gloves provide excellent abrasion resistance and grip in dry or wet conditions. They are designed to deliver key benefits above those found in traditional single-polymer coatings. The gloves provide physical performance properties such as dexterity and elasticity and conform to the hand, similar to natural rubber. They are ideal for manufacturing and light construction. Jackson Safety G60 Level 2 Polyurethane Coated Cut-Resistant Gloves and G60 Level 5 Cut-Resistant Sleeves with Dyneema fiber are ideal for metal fabrication, glass handling and automotive assembly. Both protect against minor cuts and abrasions, offer barriers against oil penetration, and provide excellent dexterity for improved productivity. 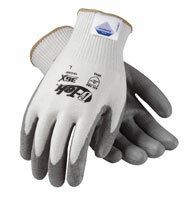 S-TEX 541 gloves feature superior cut resistance, comfort and dexterity. These ANSI Level 4 gloves provide extra protection against sharp edges, while a lightweight polyurethane palm coating ensures maximum grip. Patented Hagane Coil fiber technology offers a high level of cut resistance without sacrificing performance and comfort. Hagane steel is the high-carbon steel used in forging samurai fighting swords. The Utility Guard clip uses a belt clip instead of a clamp to attach to the user. 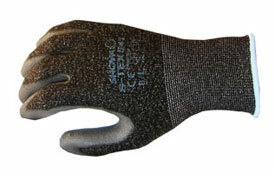 The clip’s design keeps gloves closer to the worker for easy retrieval and reduces sway. Custom safety slogans, logos and contact information can be imprinted on the clip, which is proudly made in the United States. Developed over a period of four years, this line of gloves is made with a patented ultra-high-strength yarn produced with Dyneema Diamond Technology. The gloves provide comfort and durability at the higher levels of cut-resistance standards. Gloves made with Dyneema stand up to repeated laundering, sterilization and bleaching for long-lasting value. The G-TEK 3GX glove is shown.